Ask fellow campers about "Virginia City RV Park" and nearby attractions. We stay long term at the park because of the history of Virginia City. There are a multitude of things to do in the area. The views are magnificent!! The new owners (since Nov 2017), a British couple, are the best. The staff is cordial and helpful. There is a comprehensively stocked market and a laundromat on site. There is also a restaurant serving breakfast, lunch and dinner, at reasonable prices, on the grounds. We camped at Virginia City RV Park in a Fifth Wheel. The Old West charm of a populated town, with lots to do, is prevalent. Stores, bars, casino action, museums, and places to eat abound. The stores range from kitschy to high end. LOTS to do. We've stayed here for a very long time. We stayed with the previous owners and now the park has new owners. They are super. They love the park and are working hard to improve it. They are going through and refurbishing sites as well as have moved the store and added a cafe. Yes, sites can be narrow, however 40'of fifth wheel and a MegaCab have no challenges landing in any site that they've assigned. Price is on par for a RV site in the area. Close to town and great experiences. Town is close and full of awesome shopping and touristy experiences. Food at the RV Park is great and good value. Since town is so close, Storey County doesn't allow fires. Plan on snuggling in after the sun passes behind Mt Davidson. It gets cool. We camped at Virginia City RV Park in a Fifth Wheel. Mines are open and cemetery is a must see. I was quoted 38.00 over the phone. Got there and it was 45.00. No discounts. Good: Walking distance to Virginia City. That's it. Bad: Uneven sites. Mostly full time RV's in the park. No 50 amp. Dogs off leash. Way too much money for what you get. They count on full time Rv's and do not appear to care about the visitors. We camped at Virginia City RV Park in a Truck Camper. We stayed one night but arrived about 10:00 AM before actual check-in time. The staff was wonderful about checking to see what sites were available and getting us into one right away. We did not use the facilities as we had our own, but I would DEFINITELY have no qualms about staying here again! 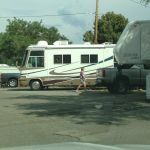 Even if there was more than one campground in town..... We camped at Virginia City RV Park in a Motorhome. Easy to walk into town, which was important since we did not have a towed vehicle. Great views. April 25,26 Virginia City RV Park, Virginia City, Nevada $40 This park is the only one in Virginia City. It is set on a hill one street down from the main street. Most sites have some view of either the cemetery, mountains or the town. An older park but the bathhouse was clean and there is a little store in the office. Over 36 sites on the property. The owner and his wife are very nice and they add to the character of this park. The park has full service sites with cable, a little store, WiFi, Laundry, a few tent sites and rental cabins. The town pool is within walking distance from the campground. Looking out from the back of our site we could see the mountains, cemetery, mines and hills all around. We were told that the Motorbike Grand Prix will take place this last weekend in April bringing in over 400 riders. All we needed to do is bring out a chair and sit down to watch the races down the hill from our site. There are many scheduled events throughout the 3 seasons to bring tourists in even Camel races. We would return to this campground. We camped at Virginia City RV Park in a Motorhome. Well first off, remember this is the only RV park in Virginia City. SO if you are going, this is it. On arrival we found another trailer in our reserved spot. RV Park people wanted to move us. The sites are not all the same, and some are very difficult to get into and to level on. So we held out for our reserved site. We had to plug into another site while the other people moved out 6 hours later. We camped at Virginia City RV Park in a Fifth Wheel. This is a nice little RV park. The price is reasonable compared to hotel rates here. Most of the spaces are not quite level so bring blocks or jacks. The shower facility is way better than I expected. It has a code on the main door and there are 4 individual bathrooms with shower, bench, sink, and toilet. My space had 20/30 amp hookup. The sewer hookup requires your hose end to screw into the opening. There was a cable TV connection but I didn't use it to rate it. The little store has a good selection of basics and is reasonably priced. We camped at Virginia City RV Park in a Travel Trailer. Look in to the Virginia and Truckee Railroad. It's a restored steam line that runs down in to Carson City. Good location with city pool across street and easy walk downtown. Only park in town. Very basic site. Good and clean shower. Good sized store/office. We camped at Virginia City RV Park in a Motorhome. Some spots with view of canyon. Bit expensive, but convenient to heart of C St. Park is rustic. Cable TV worked fine. We had shade in the afternoon. Would stay again. We camped at Virginia City RV Park in a Motorhome. This is an older park with narrow spaces. It has been regular spot for us for years. Lately it has become over grown with weeds and the sewer system has some problems. Tank dumps can be a bit of a challenge due to the slow flow. Cable TV worked and we had no trouble with the internet. Spaces are paved but to get slides open you may have to put part of your RV on the gravel that surrounds each paved pad. Some sites are a real challenge to level rigs. We camped at Virginia City RV Park in a Fifth Wheel. Visit http://www.visitvirginiacitynv.com to find out ideas on things to do. Surrounding grounds could be kept up nicer. Lots of weeds and debris around grounds. Sewer system will not drain holding tanks fully. I am an experienced RVer of 40 years and have never had a problem with draining the holding tanks. Other than these two examples, it was very quiet. The park employees were very cordial and helpful. Nice weather in area. Another plus is that it is close to the main part of town and can be walked to rather easily if in fair shape physically. However, Virginia city has a fair amount of parking in and around main part of town. We camped at Virginia City RV Park in a Travel Trailer. This is one of our close-by go-to campgrounds when we want to get out of the house for a day or two. This is another one of those places that could be spectacular if the owners put forth a little more effort. Many of the sites have great views and at night, the silence and darkness is wonderful. Great place for a telescope! The sites are paved and quite level but only a few will take longer rigs. The pavement looks atrocious but even with the cracks, it's substantial..no potholes to dodge and quite smooth. The WiFi is very problematic but the cable TV is OK and does not require a converter box. The little store is handy but Virginia City is within walking distance (if you can navigate hills) for restaurants and shops. Assorted junk scattered around that we have watched sit there for years. A couple of dump runs by the owners would improve the visuals a lot! Be warned that propane is advertised but they no longer have it. This place could be a great RV park but is still worth camping at! We camped at Virginia City RV Park in a Motorhome. I'd give the park a 10 if the pavement was better. Not terrible but unsightly cracks. They have a handy little camp store. Road is smooth and sites were quite level. Is VERY dark, cool, and quiet there at night! Walking distance to the downtown area as long as you are OK with Virginia City's hilly terrain. Easy to get in and out. Look on a map to see where 'D' street turns off the main drag for access that's not steep like many of the streets there. We camped at Virginia City RV Park in a Motorhome. This park is small and the sites are very narrow. Only a couple of sites are adequate for larger rigs or MHs. Also, prepaid reservations for the bigger sites may not be honored. There are stacks of junk and maintenance debris piled around the park and the full time slots look trashy. The WiFi was barely detectable on all of our devices. The office staff (owners) are rude and belligerent. This park my be suitable for smaller TTs and 5th wheels but I would not recommend it for MHs, especially those with toads or trailers. We ended up leaving as the site options offered to us were not equivalent to what we reserved. We camped at Virginia City RV Park in a Motorhome. This is a small, well located RV park overlooking the famous Virginia City cemetary. Luckily we're here in the low season and were given a slot with no neighbors. Otherwise it would be uncomfortably close. The bathroom block includes four separate rooms, each with a toilet and shower. Showers are free. Though the facility is older, the rooms and fixtures are clean. In the middle of the night on my trip to the bathroom I ran into some wild horses...a lovely interlude. My only real disappointment is that so much junk is being stored in the open. This gives the place a junkier appearance than it deserves. We camped at Virginia City RV Park in a Travel Trailer. Are you affiliated with Virginia City RV Park ?